STAR - LARGEST FISHING COMPETITION IN FLORIDA!! The 2019 Tournament Site is being updated. More details coming soon! 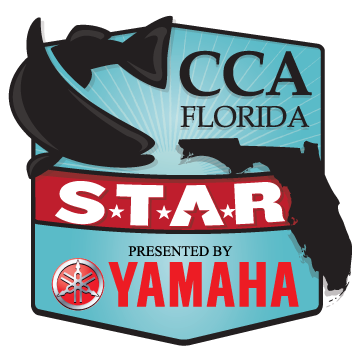 As the largest family-friendly saltwater fishing competition in Florida, CCA Florida STAR presented by Yamaha, runs from Memorial Day weekend to Labor Day and boasts amazing prizes for anglers of all ages and skill levels. A unique combination of conservation, data collection and education, plus prizes and scholarships valued at over $500,000, makes CCA Florida STAR the states can’t-miss summer-long fishing competition. No other fishing tournament in Florida has the ability to engage anglers of all ages and experience levels, including non-anglers who can participate and win simply by collecting trash and debris. Developed by CCA Texas and CCA Louisiana, the STAR competition launched in Florida in 2015 with a focus on technology and conservation. STAR uses the social media-based event to educate the public on the importance of protecting Florida’s marine resources. Recognized as a ‘catch, photo and release’ competition, STAR’s smart phone app eliminates the requirement for anglers to harvest or capture and transport fish and constantly promotes the proper handling of all species in the competition. The 101-day, family friendly angling competition offers over $500,000 in prizes in 17 divisions including tagged, non-tagged, inshore and offshore. Anglers have their shot at prizes from brand new boat, motor and trailer packages, cash, marine electronics, Yamaha motors, all-terrain vehicles, scholarships and much more. Confirmed prizes in the signature Tagged Redfish Division include a Contender Boats 22 Sport, a GMC Sierra pickup truck, a Pathfinder Boats 2200 TRS, a Hewes Redfisher 16, a 21’ Carolina Skiff and Relentless Boats Aluminum Bay/Flats boat, all powered by Yamaha Outboards. Prizes for the first two youth anglers in this division include two Carolina Skiff boats, powered with Yamaha 40 HP motors and trailers, Minn Kota trolling motor and Hummingbird electronics. T H Marine Non-tagged Redfish Division – 1st place prize of a Salt Marsh Skiff 1656 with Atlas jack Plate, Yamaha 40HP, trailer and five additional prizes. Stumpnocker Spotted Trout Division – 1st place prize of a Stumpnocker 17 tiller powered by a 40HP Yamaha with Continental trailer and five additional prizes. Piranha Boatworks Snook Division - 1st place prize of a Piranha RASO P140 with trailer & 15HP Yamaha and five additional prizes. Tigress Outriggers & Gear Dolphin (Mahi Mahi) Division - XD Top Mount & XD Carbon Fiber Outrigger package and 115Yamaha motor as the first place prize and five additional prizes. Cannon Kingfish Division - 1st Place prize of a Salt Marsh Savanna with trailer & 9HP Yamaha with Cannon Unitrol STX-TS and five additional prizes. Grouper Division (Black, Gag, Red and Scamp) – 1st place 115HP Yamaha & 240 quart Engel Cooler plus five additional prizes. Humminbird Tarpon Division – one winner of a $10,000 prize package which includes Humminbird Solix 10 and Minn Kota Terrova. Winner will be determined by a random drawing of all catch photos entered. Eligibility requirements include proper handling of the catch. Old Town Kayak Division - 1st place prize of an Old Town Predator PDL Angler with pedal floor console and 5 additional prizes. Ladies Division gives women their own prizes to compete for with first place prize being a Body Glove Inflatable Kayak and 5 other prizes or they may compete in any of the other divisions. Yamaha Guides Division for guides to compete in the Tagged Redfish and Tagged Dolphin Divisions with the first registered captain winning a Yamaha 150HP motor and 2nd & 3rd place prizes. Youth Scholarship Division presented by Academy Sports + Outdoors offers the opportunity to win one of 12 scholarships totaling $100,000 with eligible species including non-tagged redfish, spotted seatrout, snook, tarpon, dolphin (Mahi Mahi), grouper, kingfish plus ladyfish, jack crevalle and sheepshead. Power Pole Conservation Division encourages additional data collection of all species of fish caught during STAR with three prizes awarded. Costa Kick Plastic Trash Division encourages trash and debris collection with three prizes awarded. TOMO Spear Gun Lionfish Division helps with the removal of an invasive species and awards three prizes. Eligible species includes non-tagged redfish, spotted seatrout, snook, tarpon, dolphin (Mahi Mahi), grouper and kingfish. Most division winners are determined by a random drawing of all photo entries which include the official West Marine STAR measuring device, not the biggest fish, a format that encourages participants of all ages to protect and conserve Florida’s fisheries for future generations. For more information on STAR, or to register, visit our Facebook page or ccaflstar.com. The Coastal Conservation Association (CCA) was founded in 1977 after drastic commercial overfishing along the Texas coast decimated redfish and speckled trout populations. One of 19 state chapters, CCA Florida became the fifth state chapter in 1985. A 501(c)3 non-profit, the purpose of CCA is to advise and educate the public on conservation of marine resources. Through habitat restoration projects, water quality initiatives and fisheries advocacy, CCA Florida works with its over 19,000 members including recreational anglers and outdoor enthusiasts to conserve and enhance marine resources and coastal environments. Join the conversation on Facebook page or learn more at caflorida.org. If you would like to embed this tournament on to your website, copy-paste this code. All State-wide Tournament Anglers Rodeo (“STAR”) entrants participate at their own risk. Only members in good standing of Coastal Conservation Association, its youth organization, New Tide, who are registered for the 2019 State-wide Tournament Anglers Rodeo, are eligible to participate. All adult participants (18 years of age and older, as of May 25, 2019) must pay a STAR registration fee of $40 in addition to any CCA membership dues. A New Tide member must be at least 6 years old the day before making an entry in the tournament and must be no more than seventeen (17) years old as of May 25, 2019 in order to be eligible to win in the STAR Scholarship Youth Division. New Tide members are not required to pay an entry fee for STAR but are required to be current on any CCA New Tide dues. New Tide Members must also be registered for the current year STAR. Winners of any STAR-tagged Redfish prizes, and the winner of the STAR-tagged Dolphin prize may participate in STAR the following year, but only in the Conservation, Trash, and Lionfish Divisions. Members of their immediate families may participate in all STAR divisions the following year. Winners of any STAR-Tagged Redfish, the winner of the STAR-tagged Dolphin, and winners of any first prizes in the Open Division in two out of three consecutive years, may participate in STAR the following three years, but only in the Conservation, Trash, and Lionfish Divisions. Members of their immediate family may participate in all STAR divisions the following year. For the purposes of STAR, immediate family is defined as father, mother, spouse, children under 18, or relative or domestic partner living in the same household. The entire responsibility for valid member status and correctness of any official entry form rests solely on the entrant. The STAR Committee reserves the right to change dates and times of the tournament. All decisions of the STAR Committee are final and not subject to challenge. Participants must comply with State of Florida Rules and Regulations and Florida Fish and Wild-life Conservation Commission (FWC) saltwater fishing regulations. All FWC rules and regulations governing the recreational harvest of fish must be followed unless otherwise modified in these rules. If a STAR registrant is required to be a recreational saltwater license holder, their license must be current to be eligible for any STAR tournament prizes, and their license must be effective no later than the time of entry into the tournament. All participants agree to be bound by the terms of these STAR Rules, and the Release and Indemnity Agreement. Persons who currently, or at any time during the (3) years ending on May 25, 2019, are or were licensed commercial fisherman, commercial fin-fisherman, bay shrimpers, bait shrimpers, gulf shrimpers, or bait shrimp dealers, as those terms are defined by The Florida Fish and Wildlife Con-servation Commission rule 68B - 2.001, or those persons who have held licenses issued pursuant to those chapters or pursuant to any federal law as of May 25, 2019, are not eligible to participate in STAR. Professional fishing guides and charter captains licensed by the State of Florida may enter the STAR Guides Division, Lionfish, Conservation and Trash Divisions only, and may only participate as anglers in STAR when they are not chartered for hire. Professional guides and charter captains must be a current member of CCA and registered in STAR to be eligible for any STAR prizes in the Guides Division. Other registered participants in STAR are allowed to fish with a state-licensed guide or charter captain. The nominal sharing of expenses by participants is not considered operat-ing a boat for compensation. Salaried employees of the Coastal Conservation Association, CCA Florida Officers, members of the STAR Committee, STAR sponsor owners or principals, or members of their immediate families (as defined in Rule 1), are not eligible to win prizes in STAR. Any individual who participated or has intimate knowledge of the tagging and/or releasing of 2019 STAR-Tagged Redfish, or knowledge of the tagging and/or releasing of 2019 STAR-Tagged Dolphin, and their immediate families are not eligible to participate or win prizes in STAR. STAR entries in any STAR division from any regis-tered STAR participant who fishes with any person who, at the time of catch, is restricted from fish-ing in STAR, or is restricted from winning prizes in STAR, will be disqualified. Any person who has at any time committed an act which would be considered fraudulent during any fishing tournament or has been banned or disqualified from participating in a tournament is not eligible to fish in STAR. Any person who fails to pass the required STAR polygraph examination will be banned and disqualified from the remainder of the tournament and any future STAR tournaments. The Tournament will begin at the posted sunrise on Saturday, May 25, 2019, and end at posted sunset on Monday, September 2, 2019. Fish entered into competition for prizes must have been caught and landed by the registered par-ticipant. All fish entered into competition for prizes must have been hooked and caught by the con-testant on rod, reel, hook, and line (except for in the Lionfish Division). Fish caught on artificial, live baits, or dead natural baits are eligible (except for the Fly Division). There are no line test re-strictions in the tournament (except for the Fly Division). Casting the bait on behalf of a registered angler is permitted (except for the Fly Division), as is the netting of a fish by another person when landing a fish. When fishing from a boat, trolling, drifting, and anchoring are permitted. Fishing is also permitted from docks, piers, seawalls, tributaries, shorelines, and bridges, as is wade fishing. While trolling, drifting or still fishing, a rod secured in a rod holder may hook a fish; however, the angler who initially touches the rod from the rod holder must thereafter continuously fight and land the fish without assistance from any other person. Assistance from any other person is limited to casting a line to position a bait (except for the Fly Division), leadering the fish, and/or netting the fish caught by the participating angler. The following rules apply to the Lionfish Division only. Lionfish can be caught on hook and line, snagged, netted, gigged, or speared. Any type of spearfishing gear is allowed in this division (manual “Hawaiian Slings”, spear guns, etc.). Each lionfish entered in STAR must be harvested. STAR boundaries are the territorial waters of the Gulf of Mexico, the Atlantic Ocean, and Flori-da Bay for the State of Florida and U.S. federal waters, from the boundary waters of the Flori-da/Alabama border extending seaward, eastward and then southward along the Florida gulf coast, to the waters of the Florida Keys, and then northward to the common boundary waters of the Flori-da/Georgia border extending seaward in the South Atlantic. All of the waters of Everglades National Park, as defined by the National Park Service, are included in the tournament boundaries, as are all west and east coast bodies of water, including bays, harbors and tributaries. Fish taken outside of tournament boundaries, from private impoundments or other waters not legally accessible to the general public, will not be eligible for entry. Anglers are prohibited from fishing in Bahamian, Cu-ban, or other non-U.S. waters. All entries must be electronically submitted using the required tournament protocols, either by a direct upload using STAR’s official smart phone application or by using the tournament’s website, within 24 hours of each catch. Each entry must include a digital photograph of the fish on the West Marine official 2019 STAR tournament measuring device, except for the Lionfish Division and any entries in the Trash Division. The entire fish must be clearly seen with its nose on the zero line, providing visibility of total length, except for Tarpon. More than one Lionfish may be photo-graphed together with the 2019 STAR measuring device in one photo with each fish clearly dis-played in order to confirm catch number entered. For the Trash Division, there must be at least a full five gallon bucket of trash with 2019 STAR measuring device in the photo and there may be more than one submission per day. Electronic submission of all tournament entries must also in-clude the tournament division, species, length, time, date, name of angler, and Guide/Captain (if ap-plicable). Each entry can be submitted in only one tournament division or category. Failure to properly complete an electronic entry will result in entry disqualification. All fish entered shall be photographed and entered only once and only one fish per participant, per division, per species, per day may be entered in the tournament, except for in the Conservation Division, Trash Division, and the Lionfish Division. Winning entries must be verified by a STAR employee, CCA Florida em-ployee, and/or a member of the tournament committee. Participants may be required to provide ad-ditional information if requested by the STAR Director or committee (including, but not limited to, additional images from the same camera that was used for tournament photos). CCA Florida, the STAR Tournament Director, and the STAR committee reserve the right to reject any entry. Any in-tentional falsification of information provided by the registered participant will lead to immediate disqualification of the entry, and the angler will be disqualified for the remainder of the 2019 tour-nament and all future STAR tournaments. Failure to comply with these rules will result in the for-feiture of any and all prizes. All committee decisions will be final. Additionally, violators of tour-nament rules may be subject to prosecution under local, state, and federal laws. All winning fish for all tournament prizes (except 2019 STAR-Tagged Redfish, the STAR-Tagged Dolphin, the Guides Division, and the Lionfish Division) shall be determined by a drawing. The drawings in each division will be made from all verified entries made during STAR. All tournament participants must use the West Marine official 2019 STAR measuring device when submitting any entry. Information from tournament entries will be processed by the STAR Tournament Director. Partici-pant will receive an automated email reply after each entry is submitted, confirming the entry has been received by the STAR tournament. Any STAR-Tagged Redfish and any STAR-Tagged Dolphin caught during the tournament also re-quires a photographic entry and electronic submission to the STAR tournament smart phone appli-cation or tournament website. Please refer to Rule 15 for all STAR-Tagged Redfish and Rule 16 for STAR-Tagged Dolphin requirements. Spotted Trout, Snook, Redfish (non-tagged), Sheepshead, Grouper (Black, Gag, Red, and Scamp only), Dolphin (non-tagged), and King Mackerel have to meet minimum size requirements to quali-fy for entry in all divisions except for the Conservation Division, using the FWC prescribed meas-urement required for each species. FWC minimums for these species are: 15” for Spotted Trout (total length using the pinch-tail measurement method), 28” for Snook (total length using the pinch-tail measurement method), 18” for Redfish (total length using the pinch-tail measurement method), 12” for Sheepshead (total length using the pinch-tail measurement method), 24” for Black and Gag Grouper (total length using pinch-tail measurement method), 20” for Red Grouper (total length using pinch-tail measurement method), and 16” for Scamp (total length using pinch-tail measurement method), 20” for Dolphin (measured to the fork of the tail), and 24” for King Mackerel (measured to the fork of the tail). There is no minimum length for Tarpon entries, provided all other STAR and FWC rules are followed for Tarpon entries. Ladyfish and Jack Crevalle have no minimum size requirements for entry, and are eligible only in the Youth Scholarship division. Sheepshead are eli-gible only in the Youth Scholarship division. No transfer of fish among Tournament participants shall be allowed. No frozen, spoiled, gutted, or altered fish will be eligible for entry. Mutilated fish are not eligi-ble for entry, except for in the Lionfish Division. In the Lionfish Division only, mutilated fish due to spearing, gigging, or snaring, or due to fin-clipping when harvested, are eligible for entry. STAR-Tagged Redfish tags will read: “No FL _____ 2019 CCA FLORIDA/STAR CALL 844-387-7827 No FL _____” Release me. Winners will be determined by time of catch entry based on date and time the entry is electronically received by the STAR Committee. Only the first Eight (8) STAR-Tagged Redfish recaptured by registered STAR anglers during 2019 Tournament dates and certified by the STAR Committee will be eligible for prizes (no more than 6 adult prizes and no more than 2 Youth prizes will be awarded). Youth entries in the STAR-Tagged Redfish division are eligible for youth prizes only. To be eligible, each STAR-Tagged Redfish, with the tag still attached to the fish, must be digitally photographed on the official 2019 tournament measurement device, and electroni-cally submitted consistent with the provisions in Rule 12. Any STAR-Tagged Redfish caught in the tournament may be released, but only after cutting the STAR tag off of the fish as close to the fish’s body as possible. The tag must then be kept to be verified by the STAR Committee. Each partici-pant shall be eligible to win only one prize for a STAR-Tagged Redfish. If harvested, all recaptured STAR-Tagged Redfish must be within the FWC slot of 18” to 27”. If a STAR-Tagged Redfish is outside of the slot and is harvested, the catch will be disqualified. Participants who catch a STAR-Tagged Redfish must also call the STAR Tournament Director at 844-387-7827 within two (2) hours after landing the tagged fish. The angler will be directed to take the cut tag or the tagged redfish to a designated location to verify the tag or the STAR-Tagged Red-fish. This must occur within 72 hours of catching the STAR-Tagged Redfish or the entry will be disqualified. Any participant submitting a STAR-Tagged Redfish entry must submit to a polygraph examination within 72 hours after the entry is verified by STAR. The parent, legal guardian, adult sponsor, or adult witness of a Youth participant submitting a STAR-Tagged Redfish or STAR tag for a prize will be subject to STAR’s polygraph requirements. STAR-Tagged Dolphin tags will read: “No FL _____ 2019 CCA FLORIDA/STAR CALL 844-387-7827 No FL _____”. Winner will be determined by time of catch entry based on date and time the entry is electronically received by the STAR Committee. Only the first STAR-Tagged Dolphin recaptured by a registered STAR angler during 2019 Tournament dates and certified by the STAR Committee will be eligible for a prize. Youth entries in the STAR-Tagged Dolphin division are eligi-ble for a youth prize only, with a maximum value of $10,000. To be eligible, the winning STAR-Tagged Dolphin, with the tag still attached to the fish, must be digitally photographed on the official 2019 tournament measurement device, and electronically submitted consistent with the provisions in Rule 12. Any STAR-Tagged Dolphin caught in the tournament may be released, but only after cutting the STAR tag off of the fish as close to the fish’s body as possible. The tag must then be kept to be verified by the STAR Committee. Each participant shall be eligible to win only one prize for a STAR-Tagged Dolphin. If harvested, all recaptured STAR-Tagged Dolphin must meet the 20” minimum length (measured to the fork of the tail). If a STAR-Tagged Dolphin is below the legal minimum and is harvested, the catch will be disqualified. Participants who catch a STAR-Tagged Dolphin must also call the STAR Tournament Director at 844-387-7827 within two (2) hours after landing the tagged fish. The angler will be directed to take the cut tag or the tagged dolphin to a designated location to verify the tag or the STAR-Tagged Dol-phin. This must occur within 72 hours of catching the STAR-Tagged Dolphin or the entry will be disqualified. Any participant submitting a STAR-Tagged Dolphin entry must submit to a polygraph examination within 72 hours after the entry is verified by STAR. The parent, legal guardian, adult sponsor, or adult witness of a Youth participant submitting a STAR-Tagged Dolphin or STAR tag for a prize will be subject to STAR’s polygraph requirements. The Tarpon Division allows any angler 18 years old and older as of May 25, 2019 who is a current CCA member and registered in the tournament to enter a qualifying catch of a tarpon. One prize winner from all eligible Tarpon entries will be determined by drawing. To be eligible, each eligible Tarpon entry caught for STAR must follow the strictest handling requirements. The Tarpon must be digitally photographed with the official 2019 tournament measurement device in full view with the fish, and electronically submitted consistent with the provisions in Rule 12. Regardless of size, all tarpon pictures must be taken with the fish still in the water with the STAR measurement device next to it. It is not necessary for the device to be opened next to the fish, and it is not neces-sary to measure the full length of the fish. Anglers are allowed to grab the tarpon by the lip for the photograph with their hand only. If any type of lip-attachment device is used to hold the Tarpon, the entry will be disqualified. Tarpon entries will also be disqualified if an angler reaches through the fish’s gills at any time, or brings the Tarpon over the gunwale of the boat. Each Tarpon entry must also demonstrate the fish was legitimately caught. Leader releases of Tarpon are encouraged, provided all other aspects of the Tarpon Division rules are strictly followed. The STAR competition strongly suggests all anglers land Tarpon as quickly as possible and STAR rules require Tarpon re-suscitation before release. Photographic entries of a Tarpon jumping away from the boat will be disqualified. The Open Division allows any angler 18 years old and older as of May 25, 2019 who is a cur-rent CCA member and registered in the tournament to enter a qualifying catch of an eligible tourna-ment species. All fish must be entered in accordance with Rule 12. Lady anglers, fly anglers, kayak anglers, and registered anglers fishing with guides, are all eligible to enter fish in the Open Division. However, all tournament entries can be only entered in one division or category. Eligible species are Spotted Trout, Snook, Redfish (non-tagged), Grouper (Black, Gag, Red, or Scamp only), Dolphin (non-tagged), and King Mackerel, subject to minimum length requirements outlined in Rule 12. Prizes will be awarded by drawing from all verified entries in each Open Divi-sion category. Any lady angler 18 years old and older as of May 26, 2019 who is a current CCA member and registered in the tournament is eligible to enter qualifying entries in the Ladies Division. Eligible species are Spotted Trout, Snook, Redfish (non-tagged), Grouper (Black, Gag, Red, or Scamp only), Tarpon, Dolphin (non-tagged), and King Mackerel, subject to minimum length re-quirements outlined in Rule 12. Entry picture must include fish on official 2019 STAR measuring device. All entries must be submitted consistent with the provisions of Rule 12. Tarpon entries must follow the photographic and handling requirements of Rule 17. Prizes will be awarded by drawing from all verified entries in the Ladies Division. Only one-handed rods and single-action reels designed specifically for fly fishing may be used in the fly division. Any type of fly line and backing combination may be used, and there are no re-strictions on the weight of the fly rod. The class tippet must be at least 15" long with a maximum breaking strength of 20 pound test. Flies must be of the recognized type of artificial fly according to IGFA rules. No scent, either artificial or natural, is allowed. Eligible species are Spotted Trout, Snook, Redfish (non-tagged), Grouper (Black, Gag, Red, or Scamp only), Tarpon, Dolphin (non-tagged), and King Mackerel, subject to minimum length re-quirements outlined in Rule 12. Entry picture must include fish on official 2019 STAR measuring device and fly rod and reel on which the fish is caught. All entries must be submitted consistent with the provisions of Rule 12. Tarpon entries must follow the photographic and handling require-ments of Rule 17. Prizes will be awarded by drawing from all verified entries in the Fly Division. A kayak is defined as any vessel that has no form of power other than that supplied by its oc-cupant. Examples of qualified vessels for the Kayak Division include kayaks, canoes, and paddle-boards. Vessels powered by combustion, battery-operated, and electric engines are not eligible, nor are those powered or propelled by sail. “Mother-shipping” (the transportation of a kayak by anoth-er boat or vessel to where the kayak operates independently from the boat or vessel that transports it) is not allowed. Eligible species are Spotted Trout, Snook, Redfish (non-tagged), Grouper (Black, Gag, Red, or Scamp only), Tarpon, Dolphin (non-tagged), and King Mackerel, subject to minimum length re-quirements outlined in Rule 12. Entry picture must include fish on official 2019 STAR measuring device and recognizable self-propelled vessel (as described in rule 22) features from which the fish is caught. All entries must be submitted consistent with the provisions of Rule 12. Tarpon entries must follow the photographic and handling requirements of Rule 17. Prizes will be awarded by drawing from all verified entries in the Kayak Division. New Tide tournament registrants are eligible to participate in the Youth Scholarship Division, the STAR-Tagged Redfish Division, the STAR-tagged Dolphin Division, the Conservation Division, the Lionfish Division and the Trash Division. No other STAR entrants are eligible for the Youth Scholarship Division. Eligible species in the STAR Youth Scholarship division are Spotted Trout, Snook, STAR-Tagged Redfish, Redfish (non-tagged), Sheepshead, Grouper (Black, Gag, Red, or Scamp), STAR-Tagged Dolphin, Tarpon, Dolphin (non-tagged), King Mackerel, Ladyfish, and Jack Crevalle, subject to minimum length requirements outlined in Rule 12. All entries must be submitted consistent with the provisions of Rule 12. Tarpon entries must follow the photographic and handling requirements of Rule 17. The STAR Youth division participant must have a parent, guardian, or adult sponsor. Upon STAR entry (either on the STAR website or the STAR APP), the parent, guardian, or adult sponsor of every Youth entrant agrees to abide by all STAR rules, including STAR polygraph testing re-quirements. All Youth Division winners must agree to abide by STAR scholarship rules and re-quirements. Parents, guardians, and adult sponsors are not required to be CCA members. Howev-er, if any parent, guardian, or adult sponsor wants to participate in STAR themselves, they must be a CCA member, consistent with the provisions of Rule 1. Professional guides and charter captains participating in this division must be a properly-licensed Florida charter captain and a member of CCA. All guide and captain entrants must be a current CCA member and must register for the 2019 STAR tournament and pay the $40 STAR entry fee. Guides and charter captain may only participate in STAR when they are not for hire (i.e. when they are fishing without paid clients). The first three STAR-Tagged Redfish or STAR-Tagged Dolphin, or any combination of 3 STAR-Tagged fish of both species, caught by guides or charter captains registered for STAR will be the winners of the Guide’s Division. Winners will be determined by time of catch entry based on date and time the entry is electronically received by the STAR Committee. Guides or charter cap-tains can only win one prize in the 2019 STAR. Guide Division prizes are separate from other STAR-Tagged fish divisions. To be eligible, the winning STAR-Tagged Redfish or STAR-Tagged Dolphin, with the tag still attached to the fish, must be digitally photographed on the official 2019 tournament measurement device, and electronically submitted consistent with the provisions in Rule 12. Any STAR-Tagged Redfish or STAR-Tagged Dolphin caught in the tournament in the Guides’s Division may be released, but only after cutting the STAR tag off of the fish as close to the fish’s body as possible. Guides and charter captains who catch a STAR-Tagged Redfish or a STAR-Tagged Dolphin must also call the STAR Director at 844-387-7827 within two (2) hours after land-ing the tagged fish. The angler will be directed to take the cut tag or the tagged redfish, or the tagged dolphin, to a designated location to verify the tag or the STAR-Tagged Redfish or the STAR-Tagged Dolphin. This must occur within 72 hours of catching the STAR-Tagged Redfish or STAR-Tagged Dolphin or the entry will be disqualified. Any guide or charter captain submitting a STAR-Tagged Redfish or a STAR-Tagged Dolphin entry must submit to a polygraph examination within 72 hours after the entry is verified by STAR. Clients of guides when under charter may submit entries for the STAR tournament for all other divisions, provided they are CCA members, registered for the 2019 STAR, and provided they fol-low the provisions of Rule 12 and all other STAR rules. All registered 2019 STAR participants are eligible to participate in the Conservation Division. Any species of fish of any length caught by STAR participants are eligible for entry in this division. Entries must follow the exact provisions of Rule 12. All fish must be photographed and measured on or with the official 2019 STAR measuring device, and all STAR anglers are required to follow FWC rules for handling each species. Tarpon entries must follow the photographic and handling requirements of Rule 17. Each entry must include an accurate measure of the fish entry. Fish en-tered in other divisions are not eligible for entry in the Conservation Division. Winners of the Con-servation Division will be determined by a drawing. All registered STAR participants are eligible to participate in the Lionfish Division. Lionfish is the only species of fish eligible for entry in this division. Entries must follow the exact provisions of Rule 12. More than one Lionfish may be photographed together with the 2019 STAR measuring device in one photo with each fish clearly displayed in order to confirm catch number entered. All Lionfish entered in STAR must be harvested. Lionfish entries can be caught on any hook and line rod and reel combination, snagged, netted, gigged, or speared. Any type of spearing device is al-lowed in this division. Lionfish Division winners will be determined by the highest number of lion-fish harvested during all 2019 STAR tournament days. Youth (New Tide) participants are eligible to submit entries in the Lionfish Division and are eligible for Lionfish Division prizes. 2019 STAR Participants who gather trash while on the water and submit a photo entry of at least a 5 gallon bucket full of trash with the 2019 official measuring device in their entry are eligible. Larger amounts of trash may be collected and submitted with the 2019 STAR measuring device in the photo submission. If trash objects are too large to be removed STAR participant should take a photo of debris with the 2019 STAR measuring device and include the latitude and longitude of the object in the entry. Authorities will be notified and the debris will be removed. All eligible entries will be included in a random drawing at the end of the 101 days of STAR for three prizes. Each person entering the 2019 STAR agrees to submit to a polygraph examination. The STAR Committee reserves the right to select polygraph examiners to administer polygraph tests. All poly-graph examinations required shall be taken at the time, place, and by the examiners designated by the STAR Committee. Each contestant agrees by his/her signature on the official CCA 2019 STAR entry form, to submit to a polygraph examination if required by the STAR committee and abide by its conclusion. All travel expenses are to be paid by entrant. Failure to submit to or pass the re-quired polygraph examination shall result in angler disqualification for current and all future STAR tournaments. Any protests must be submitted in writing to: Leiza Fitzgerald, STAR Tournament Director, P.O. Box 568886 Orlando, FL, 32856. The decision of the STAR Committee, in its sole discretion, shall be final on any and all tour-nament matters and are not subject to appeal. In the event of litigation or arbitration between a participant and CCA Florida arising out of any aspect whatsoever of the STAR tournament, the losing party in said litigation or arbitration shall be bound to pay reasonable attorney’s fees, expenses of litigation, court costs, and other costs incurred by the winning party in said litigation or arbitration. By participating in STAR, anglers agree to the use of their name, likeness, photograph, video, or other identifying information by CCA Florida in promotional, advertising, educational, or research materials in whatever form CCA Florida chooses in its sole discretion. All prizes for all 2019 STAR divisions and categories shall be awarded at the discretion of the Tournament Committee. Specific prizes for each tournament division and category shall be chosen and awarded by the Tournament committee. Participants shall be eligible to win only one prize or scholarship in this Tournament with the exception of the Lionfish or the Trash Division. Winners of the Lionfish and the Trash Division prizes may also win a prize in another division, provided they follow all rules pertaining to each STAR division. Any youth or child can win only one (1) $25,000.00 scholarship or may win no more than five (5) $5,000 scholarships or no more than a total of $25,000 in scholarships in this Tournament during their lifetime. If they have won a $5,000 scholarship in the past, they are not eligible to win the $25,000 scholarship, only additional $5,000 scholarships. Once a youth angler has won (1) $25,000 scholarship or a total of $25,000.00 they are no longer eligible to win in the Youth Scholarship Division during their lifetime (they are eligible to participate in the tagged redfish & dolphin, conservation, Lionfish and Trash divisions). Tournament participants may only enter a fish in one division, which must be chosen at the time of electronic entry. STAR-Tagged Redfish winners, the STAR-Tagged Dolphin winner, the Tarpon Di-vision winner, Youth Scholarship winners and first place divisional winners will be required to at-tend the STAR Awards Ceremony on October 19, 2019 to receive their prizes. All other prizes will be awarded to attending winners during the STAR Award Ceremony. If any winners of other prizes are not present at the Awards Ceremony, their prizes will be available to be picked up at the CCA office in Orlando or will be shipped if possible. The STAR Committee retains sole discretion to award all STAR prizes. All prizes will be presented “as is” to each winner (or winner’s designee) after the Tournament at the STAR Awards Banquet. The STAR Committee may replace or substitute alternative prizes for any advertised prizes at its sole discretion. If a 2019 GMC Sierra Double Cab pickup truck is awarded to any participant of this year's STAR, it's MSRP cannot exceed $49,000, and the winner must take delivery by November 30, 2019. All prize winners are solely responsible for payment of any applicable taxes, fees, and costs associated with the prize. The STAR Committee will issue all required tax documents to the appro-priate tournament winners. Tournament winners must complete and return all documentation be-fore receiving their prizes. All prize winners are responsible for processing, registration, and tax documentation in a timely fashion at specified sporting goods/marine/automotive dealerships. ALL STAR ENTRANTS PARTICIPATE AT THEIR OWN RISK. PARTICIPANTS RECOGNI-ZE THAT THERE ARE INHERENT RISKS ASSOCIATED WITH THE SPORT OF FISHING IN-CLUDING, BUT NOT LIMITED TO, INJURY OR DEATH DUE TO DANGEROUS WEATHER CONDITIONS; WATER CONDITIONS; TRAILERING, OPERATING, MAINTAINING, DOCKING OR OTHERWISE HANDLING BOATS; EQUIPMENT SUCH AS KNIVES, HOOKS, CLUBS, GAFFS, ANCHORS, LINES; HANDLING FISH AND THE INHERENT DANGERS OF BEING IN THE WILD OUTDOORS SUCH AS DANGEROUS ANIMALS, FISH, STRUCTURE OR OTHER FISHERMEN. IN CONSIDERATION FOR BEING ALLOWED TO ENTER THE STAR TOURNA-MENT, EACH PERSON AGREES AND CONTRACTS TO RELEASE, INDEMNIFY AND HOLD HARMLESS COASTAL CONSERVATION ASSOCIATION FLORIDA, ITS OFFICERS, DIREC-TORS, EMPLOYEES, REPRESENTATIVES, THE STAR TOURNAMENT DIRECTOR AND ALL COMMITTEE PERSONS, THE TOURNAMENT SPONSORS AND VERIFICATION STATION OWNERS AND THEIR RESPECTIVE OFFICERS, DIRECTORS, EMPLOYEES AND REPRESEN-TATIVES FROM ANY AND ALL LIABILITY, CLAIMS OR DAMAGES ARISING OUT OF OR IN ANY MANNER WHATSOEVER CONNECTED WITH THE TOURNAMENT INCLUDING ITS PLANNING, OPERATION OR CONDUCT AND INCLUDING BUT NOT LIMITED TO CLAIMS FOR PERSONAL INJURY, WRONGFUL DEATH, SURVIVAL DAMAGES, ECONOMIC LOSS, PROPERTY DAMAGES OR CLAIMS RELATING IN ANY WAY TO THE TOURNAMENT. IT IS THE EXPRESS INTENTION OF THIS AGREEMENT THAT EACH ENTRANT IS INDEMNI-FYING EACH OF THE FOREGOING RELEASED AND INDEMNIFIED PARTIES FROM THE CONSEQUENCES OF THEIR OWN NEGLIGENT CONDUCT, WHETHER SOLE NEGLIGENCE OR CONTRIBUTING NEGLIGENCE, GROSS NEGLIGENCE, OUTRAGEOUS MISCONDUCT, STRICT LIABILITY, COMMISSION OF TORT, BREACH OF CONTRACT, AND BREACH OF WARRANTY. THE PARENT OR GUARDIAN OF ANY MINOR ENTERING IN, REGISTERING FOR OR FISHING IN THE TOURNAMENT DOES FURTHER CONTRACT AND AGREE THAT THIS RELEASE AND HOLD HARMLESS AGREEMENT SHALL BE BINDING UPON ANY MI-NOR ENTERING THE TOURNAMENT. WINNER WILL BE REQUIRED TO EXECUTE AN AD-DITIONAL RELEASE, INDEMNITY AND HOLD HARMLESS UPON RECEIPT OF PRIZE. ANY CONTROVERSY OR CLAIM ARISING OUT OF OR RELATING TO THE TOURNAMENT SHALL BE SETTLED BY BINDING ARBITRATION CONDUCTED IN PALM BEACH, FL, IN ACCORDANCE WITH THE COMMERCIAL ARBITRATION RULES OF THE AMERICAN ARBI-TRATION ASSOCIATON AND JUDGMENT UPON THE AWARD RENDERED MAY BE ENTE-RED IN ANY COURT HAVING JURISDICTION THEREOF.